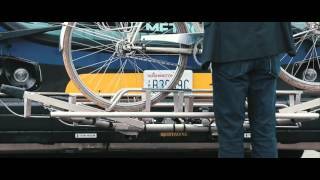 Originally designed for the Kawasaki M8 rail car, the SwingLock™ offers a safe and highly secure bicycle wheel retention system designed for light, medium and heavy rail trains, and select commuter vehicles. The SwingLock™ interior bike rack includes upper and lower assemblies that collectively secure the bike. The upper assembly consists of a padded hook and channel that supports the bikes front wheel. The lower assembly utilizes a swinging rear (bike) wheel stabilizer that stows flush to the vehicle wall when not in use. The SwingLock™ offers the highest degree of safety and bicycle retention of any interior bike rack available. The fasteners, attachment hardware and components were designed with strength requirements to meet Federal Railroad Administration regulations (49 CFR 238.233c) for the securement of a bike rack with bicycle to the car wall. The SwingLock™ is designed to secure the bicycle in a manner that prevents if from becoming dislodged, allowing bicycle movement (railcar direction of travel “swaying" or railcar transverse direction “swinging") or any other unsafe action that could be harmful to the bicycle rider or passengers. The fasteners, attachment hardware and components were designed with strength requirements to meet Federal Railroad Administration regulations (49 CFR 238.233c) for the securement of a bike rack with bicycle to the car wall. Lifting motion is kept to a minimum; in most cases requiring the user to only lift the bicycle mere inches off the floor. Bicycles stowed in the rack are oriented at such an angle as to not impede on the walking aisle of the vehicle. The lower wheel assembly employs a gas spring-loaded rear hoop to secure the rear wheel. All moving parts are stainless steel, and all outside corners of the rack are rounded for increased safety. For detailed product specifications including dimensions, weight capacities, safety, construction and operational information, please see the SwingLock Spec Sheet (.pdf) available under Downloads on this page. Jerry Stewart, Vice President of Engineering, has logged a lot of bike commuting miles in his 11-year tenure with Sportworks. Jerry bikes to work an average of two days per week, year round. Bound and determined to commute by bike even through the worst weather (and even though his wife thinks he’s a bit crazy), Jerry has braved some of the the worst rain and even 6” of snow on his 40 mile, round trip commute.